The role of oxygen in the steel making process is absolutely critical in determining the correct level of quality in the finished product. The technology of oxygen injection post combustion, allows precision in facilitating the conversion of CO to CO2 just above the slag surface. Currently, oxygen steelmaking accounts for 65% of worldwide crude steel production and is thus the predominant steelmaking process. The oxygen converter utilizes oxygen as an oxidation source for reacting with other elements to convert iron into steel and increase the bath temperature. These reactions are characterized by a high reaction rate, short residence time, numerous influencing factors and complicated reaction processes. Thus, the quantity of oxygen utilized plays an important role in determining the steel quality. Specifically, if the amount of oxygen injected is too small, the endpoint carbon content will exceed the required value or the endpoint temperature may be too low. If the amount of oxygen is too large, the molten steel will be overoxidised, the consumption of alloys will increase, the temperature may be too high and the yield of liquid steel will decrease. Therefore, determination of the exact oxygen blowing quantity has tremendous influence on the steelmaking process. In the BOF and EAF steelmaking processes, carbon is oxidized by oxygen to CO. If the CO can be combusted to CO2 the energy release is three times greater. This energy can be used in the BOF to melt more scrap which significantly reduces the total energy to produce steel since using scrap in place of hot metal requires less than 30% of the energy. In the EAF, the energy reduces the electrical energy by 50 to 100 kwh/t of steel and increases productivity. However, it is difficult to optimize and control post combustion. If it is done too far from the steel, the energy is not transferred effectively. If it is done too close, the depostcombustion will occur by the following reactions which will limit post combustion. A technology is required which can inject oxygen into the converter just above the slag so that CO can be combusted to CO2. The supply of oxygen for post combustion must be well distributed above the slag surface for an efficient combustion of CO. Transfer of the heat to the slag and metal phase is also to be considered. One possible way is to add several small orifices around the main supersonic nozzle tip. Lance distance has to be adjusted so that oxygen through the orifice is available for combustion of CO to CO2 above the slag surface. Still another method could be a lance with double flow for oxygen. In the main oxygen lance, a separate oxygen inlet and oxygen control system can be provided which is solely dedicated to post combustion. 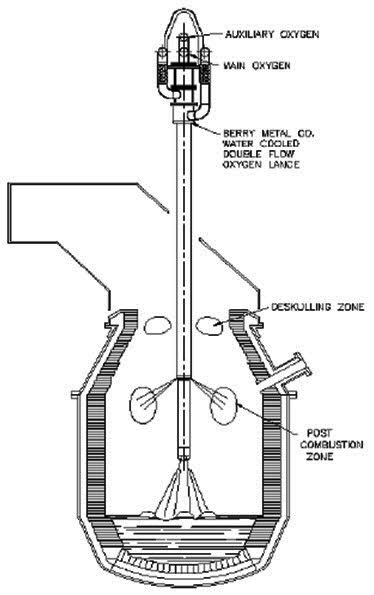 This design may provide better control of oxygen for post combustion without affecting the oxygen flow through the main lance. One of main requirement of oxygen flow for post combustion is that velocity and angle of oxygen flow should be low to avoid the refractory wear. Nozzle diameter, angle of oxygen flow and location of nozzle are the principle design issues. Post combustion was initially promoted for its benefits related to process improvements and increased production. Though these benefits are still very real, there is an increasingly number of “side” benefits that in some instances are far out weighing the production related improvements. Post combustion can be used in all types of BOF shops – suppressed combustion hoods and open combustion hoods, large 300 ton converters and small 80 ton converters. Post combustion lances are also used in Q-BOP and EAF shops.